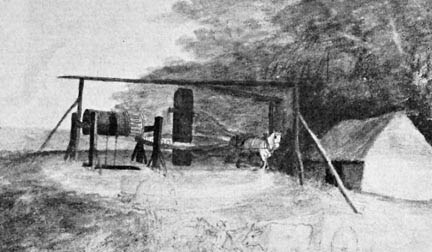 Prior to 1842 horses were most often used outside of mines to help raise the coal up through the shafts, often with the aid of horse gins such as this. As I noted in the last Technical Note, the passage of legislation in the UK in 1842 prohibited the employment of women and children under 13 in underground mines. 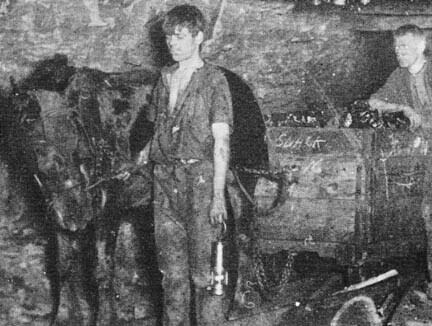 Their labor had to be replaced, and the replacement was often with pit ponies. However, unlike women and children who could be trained to cope with working heights shorter than they were, this did not hold true for horses. And so there had to be some change in the way that the mines were operated, particularly where the coal seam was not that high. Today’s topic will discuss some aspects of how they drove that, and will end with a comment on concrete shaft liners that might have some relevance to the recent events in the Gulf of Mexico. 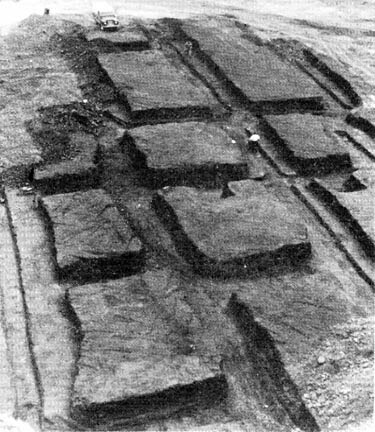 One of the first steps attempted to gain the extra height was to cut a deeper passage in the floor of the mine. This was often softer than the roof, and would give the additional height needed, but as I will explain later, often only for a short time. This did not prove to be that popular, and the more common practice was to fire explosives in the overlying rock and thus drive a higher tunnel, for the passage of supplies in, and coal out. The brow of that excavation was generally kept up with the face of the mining operation, and required special support. (There was a man killed at a mine I was working at, when this area collapsed). It was found that the tunnel was more stable if the overlying roof was broken out in the shape of an arch, and it could be shaped so that steel arch girders could be placed to hold the roof rock in place. There was, however, a problem in getting rid of the rock that was blasted down. Taking it out using the tubs occupied valuable space and time and earned no-one any money. It was found that if the coal on either side of the main tunnel was removed, that this would leave a space into which the overlying rock could be packed. The larger blocks of rock were used to build the walls from the floor to the top of the opening, and then the “stone man” would shovel the smaller broken rock behind it, packing it up to the roof and providing additional support. This gave a gain in production from the coal removed, while helping with disposal of what would otherwise be waste rock. The illustration helps illustrate another advantage of this over taking up the floor. The rock under the coal is often a shale, that can soften. When the rock weight that rested on the rock removed from the tunnel shifts, it does so to the rock immediately beside the tunnel. If that is a solid connection, then the additional pressure is applied to the underlying shale. If this is softer rock it can flow out under the pressure, pushing the rock floor of the tunnel upwards, which is known as floor heaving. This can get to the point that it reduces the height of the tunnel by over two-thirds and the tunnel floor has to be removed with a secondary mining pass. If the coal has been removed to either side of the tunnel, then the floor heave that takes place can occur in the pack area outside the area of the working tunnel, as the picture above shows. This makes it easier to maintain a clear passage. 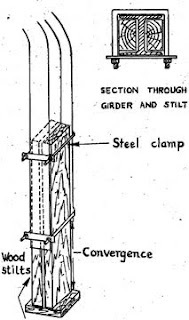 However, there will still be some compression of the rock packs as the weight of the rock comes on them, and so the arch girders that are used to support the tunnel are put on small wooden stilts. 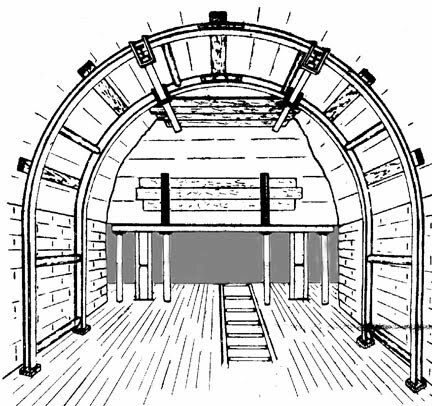 As the weight comes on the arch, it is pushed down between the two pieces of wood, converging without distortion, and still supporting the roof. Arch with stilts (Deputy’s Handbook). Steel arches of this type were used in much roadway construction, both for mining and civil tunnel support (including subway systems) for many years. 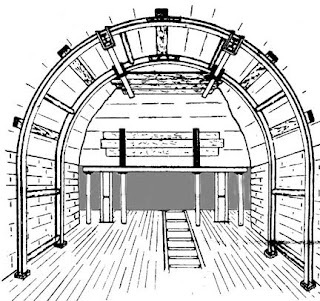 However the arches, even when supported with wooden struts between adjacent arches, are not waterproof. Thus they were not of great benefit when, for example, it became necessary to sink a shaft through water bearing rock to get down to the coal. There were two ways of dealing with this, one was to weld steel plates together to give a continuous casing of the shaft, from the surface down to the seam. The other was to use concrete to pour a liner to the shaft as it went down. However there are a couple of problems with using concrete alone as a supporting system, for while concrete is good as a support that resists loads that do not change much, and that put the support into compression it is brittle, and more vulnerable to tensile loading. 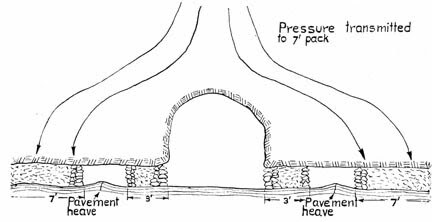 It has been noted that where conventional concrete comes under a pressure, then the small fissures in the structure of the concrete can open up and extend so that the concrete becomes permeable. Part of this is due to the differential compression of the different phases of the material in the concrete. If the loading is relatively even around a cylinder in compression, then the cracks can remain quite small, but when, for example, you get the differential loading, such as that which is shown in the picture above of the pressure distribution around the arch with two walls, one can imagine how there is sufficient differential loading that cracks can open and water, or other fluid, enter the passage. As a result in mining operations concrete has proved, alone, to be an unreliable water seal and often requires additional steps to prevent water access, or ways to collect and trap the water, so that it can be carried away without interfering with workings. From personal experience, lying on your side shoveling coal, while water drips onto your back has little to recommend it.